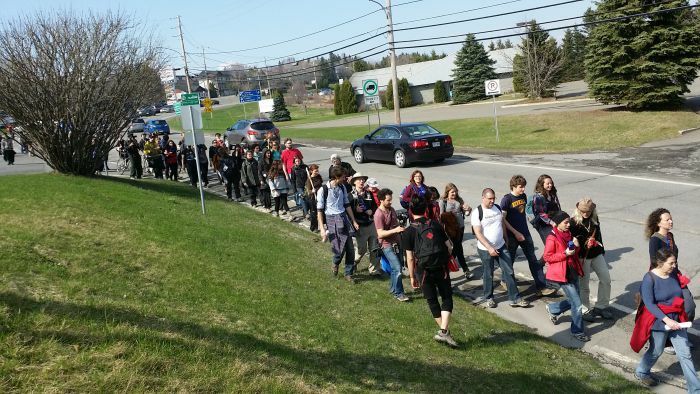 At the start of the Marche des Peuples pour la Terre Mere – the Peoples Walk for Mother Earth -Alyssa Symons-Belanger asserted that this walk is both a symbol and a strategy in the movement against pipelines and tar sands. It is a statement in itself to carry out a 34 day, 700 km walk from Cacouna to Oka along the paths of the proposed Transcanada Energy East and Enbridge Line 9B tar sands pipelines. But it is also a space to build a movement through the act of simply being together, and having time to build relationships with citizens and activists along the way – a kind of half-retreat, half-month long-direct action adventure for people from all corners of Québec. The most immediately striking feature of the marche is the intense beauty of the Québec countryside. We pass enormous fields and endless skies, and the St. Lawrence River is constant and magnificent. We take lunch breaks beside creeks and next to farms, and travel between sleepy towns, suburban villages, and the occasional overwhelming city. Physically being on the land that is being threatened by pipelines makes the reality of these projects infinitely more concrete and direct. Our “belle gang” is a group that fluctuates between 30 and 70 people at a time. The variety of identities stretches from dreadlocks to silver hair, from gortex boots to bare feet, from grassroots activists and NGO employees to theatre students and hospital workers. Philippe Dumont joked that the marche is like Occupons Montreal on foot – and our long list of committees have been unusually efficient. Even as we wrangle to find a system that fits everyone’s collective needs, there is a remarkable openness and commitment to the community and the cause. Each day is a constant cycle of meeting people and exchanging ideas. As we walk, marcheurs on bicycle go door to door to gather signatures for the STOP Oleoduc “Coule Pas Chez Nous!” (“No Spills in our Home!”) campaign. Thanks to the Chorale de Peuple, we have a repertoire of goofy and snarky songs to boost energy and attract support as we mobilize. While we run into the occasional pro-pipeline households, many citizens are genuinely dismayed about the lack of information they have received, and are enormously excited about our mobilization that breaks the isolation. Along the route, the marche has brought citizens together through regional open mics and cabarets. In cafes and community centres, marcheurs and local artists perform slam poetry, acoustic covers, and crowd energizers. A staple has been a forum theatre piece in which the audience is invited to convince two jaded activists (actors) to persevere after petitions and demonstrations have failed to stop TransCanada from building a port. The ideas brought forward begin a conversation on creative and direct action within each community, generated by the people who will be doing the actual mobilization. In the context of growing indigenous presence in the environmental movement, the marche has taken slow but real steps to include those voices. Indigenous community members are invited at every stop to meet and discuss the reality of this project on their territory, and local musicians have performed at most soirees. From the start of the marche, Innu slam poet Natasha Kanape-Fontaine played an enormous role in putting the indigenous experience at the forefront. As folks arrive with different levels of experience, a rotation of workshops has emerged towards building our capacity to mobilize and form strong activist communities. We practice interviews with journalists, plan strategic actions, unpack anti-oppression and indigenous history, and reanalyze our interactions through forum theatre. These trainings both build the terrain of actions that can be done on the marche itself, but also builds a new generation of activists to use these skills long after this month ends. 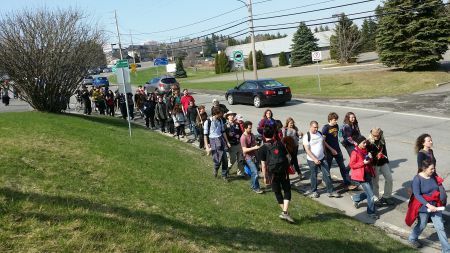 At this halfway point in the marche, it is clear that the rumble against tar sands and pipelines is growing throughout Québec. In a burst of truly citizen-driven, grassroots organizing, the Marche des Peuples pour la Terre Mere is laying serious groundwork for a political escalation against these projects.